Prospective parents who are wanting to adopt a baby will undoubtedly face an unknown amount of waiting. The standard adoption process is rife with roadblocks and red tape, causing a lot of stress on waiting couples. A is 4 Adoption was founded to minimize the complications associated with many adoption agencies you’ll visit in California. Our adoption center strives to streamline open adoption with comprehensive support for both the birth mother and adoptive parents. If there is something that helps both parties in order to benefit the child, we’ll help! 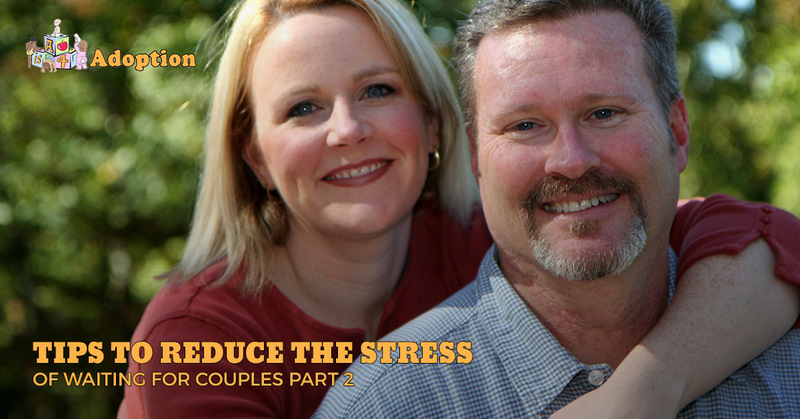 In our last blog, we discussed a few ideas that can be beneficial in helping couples to avoid undue stress while waiting for their miracle to come home. Today, we’ll look at a couple more tips to give you the edge during this crucial time of standing by. The waiting process for domestic adoption can feel like an eternity, we know! Couples who are watching the clock tick by can benefit from being productive. There are many tasks that need to be done before your baby arrives, making working together and being productive a strong choice for your future benefit. From choosing a pediatrician to preparing the baby’s room, new parents will have their hands full. Organizing a checklist and productively taking care of it can be very helpful for reducing the stress surrounding adopting a child. Need more tasks to check off on your list? You can take parenting classes or study up on your choice book for insight on how to be a parent. The joys of childrearing can come with questions and concerns, and when your child is adopted, the parenting plan can change. There are dozens of options for staying busy, and taking care of errands and requirements can prove doubly beneficial. You will feel better prepared and should experience less anxiety. Doing this with your significant other can help to build your bond in this quest for starting a family. The adoption process is known to provide prospective parents with a wide range of emotions. The excitement of finally adopting your new miracle can quickly turn to frustration and sadness if some action stalls the process. Whether the birth mother changes her mind, the father is requesting custody or anything in between, unexpected events can take their toll on adoptive parents who are more than ready to grow their family. Sometimes, couples will fall into a pessimistic state, refusing to believe that their big day will ever come. A is 4 Adoption is here to streamline the process and ensure the best results, yet our quality staff cannot physically change our clients’ attitudes. Positivity will help to reduce the stress and anxiety of waiting, giving you and your partner a better outlook and more enjoyable experience. The day will come, and stressing out about it will not speed up the process, so try to be positive! Stress reduction techniques can be very helpful for couples who are waiting for what seems like an eternity. However, the joy of adopting a baby is well worth the wait! If you are looking for an adoption agency in California, try our adoption center instead. A is 4 Adoption employs the best staff to ensure that all of your needs and concerns are addressed perfectly. Contact us today to learn more!